It's been a pretty good week for executive producer Jason Netter of Kickstart Entertainment: Painkiller jane has been picked up as a series by Sci Fi and The Amazing Screw-On Head -- a pilot for an animated series based on Mike Mignola's Dark Horse comic book -- has had positive buzz as the first show tested on Sci Fi's Pulse web site. Before the pilot debuts on Sci Fi on Thursday, July 27 at 10:30 p.m., you can watch the episode on the Internet at www.scifi.com. The Continuum caught up with Netter -- who is also developing the Wolverine and the X-Men animated series -- on Friday to talk about Screw-On Head. The Continuum: Where does the series stand now? Have you just completed the pilot episode or has work started on additional episodes? Netter: Currently, we have delivered the pilot and written three additional scripts. The plan is to see how the buzz is on the web site airings as well as the ratings when the pilot launches July 27 and hopefully we will get a pick-up to go to series. The Continuum: How did you get on this project and what was your approach? How happy were you with the final product? Netter: I was lucky enough to get a jump on the material and option it from Mike as soon as I saw the first proof of the comic. I just loved the book and I thought it would make for such a unique animated project. As far as approach, the idea was to target a few strategic broadcasters. However, it didn't take long. Mark Stern made it one of his first acquisitions when he got the job at Sci Fi. As far as the final product, I think it turned out great. Bryan Fuller has done an excellent job translating the book into a television series and Chris Prynoski did a terrific job getting the animation studio to match the look and feel of Mike's style. So overall, yes, I am very please with what we turned out. The Continuum: Mike Mignola has said that he kind of took a step back from this project, and let you and you crew do your thing. How involved would you say he was? Netter: Well, in some sense that is true. He did give us freedom to create the pilot but we had to match the look of the book. We did have Mike in the loop throughout the entire process and we sent him approvals at most stages. He had quite a bit of comments on the script, the artwork and attended the voice session with Giamatti and Hyde Pierce. 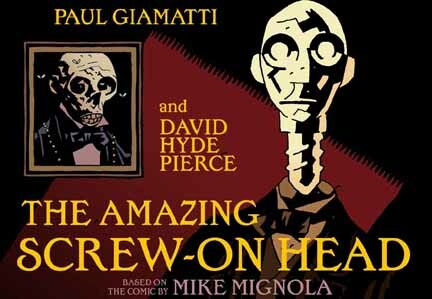 The Continuum: Is it difficult interpreting Mignola's style to animation? Netter: I think there was a lot of pressure to match the look but because Mike is so respected in the animation industry, everyone who worked on it took every extra step to make sure the look was matched. The Continuum: What about this character do you think would make a good series? Netter: I think there is just something automatically funny about a main protaganist who happens to only be a head. And the fact that he chooses his body for each individual mission allows for unlimited adventures. The Continuum: Talk about the voice cast. Netter: I think the voices are brilliant. Not only does Paul Giamatti nail Screw-On Head, David Hyde Pierce is just fantastic. In fact, there is not one voice that I would replace. I always felt that the level of cast we were able to land was such an endorsement as to what a great potential franchise we have. The Continuum: For the future, you'll probably have to create new characters, right? Netter: We have lots of ideas for many seasons to come. We are just hoping the show gets its chance at series.